Not doing too much in the garden these days, although I will have to get back to work soon. I need to spray dormancy oil on the peach tree, chelated iron and zinc on my Meyer Lemon tree, Safer's insecticide on my two flowering plants and diatomaceous earth on my eggplant. By the way, I have two huge eggplant that need to be harvested. I bet they are delicious. Maybe they'll be part of dinner tomorrow. I also have two beautiful yellow bell peppers. Amazing! I decided to work in the garden a little. I piled dirt and compost and the new potato plant. What a surprise that plant was! I guess if failed to harvest a potato in that location, because I now have a new potato plant. I also cut off lots of dead broccoli leaves and the tops of the broccoli plants that have flowered. Then I cut off a lot of dead and diseased leaves from the eggplants. I have two big eggplants which I will harvest in a day or two. There are a few more to come. I then force sprayed the leaves--tops and bottoms. There is still evidence of spider mites. Tomorrow I will use the diatomaceous earth to hopefully kill off the last of the spider mites and whatever else is eating up the eggplants. Still have some peppers. 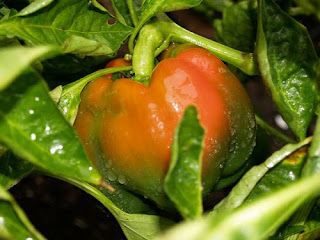 Tomorrow I will harvest two yellow bell peppers and it looks that I will soon have some more jalapenos. So, I pulled out the last of the tomato plants in Garden #1. Ate the last 2 tomatoes tonight. However, I have 3 tomato plants on the hillside. I could still possibly get some tomatoes from them. Amazingly enough, my pepper plants are still producing. I think I will have two yellow peppers in a day or two. I also have two eggplants to pick. Should I fry them, or make eggplant tapenade to put on crackers or bread. The arugula is amazing. The plants are still going strong. I planted about 15 new arugula plants. They have finally come up. It will be a while before we have arugula leaves from them. Have to check on the garlic. The green leaves have not fallen over yet and turned brown---a sign that the garlic will soon be ready. Still dealing with the spider mite on my two flowering plants on the patio. I have to get rid of it or it will spread to the vegetables. I cut off most of the leaves from both plants. Keep your fingers crossed!! Yesterday I mentioned that the chelated zinc/iron would get rid of the scale. I was mistaken. This amendment will strengthen the plant, get rid of the yellow leaves and help the plant to fight off scale. Sorry for the misinformation, but gardening is all about learning from our mistakes, and trying not to make the same mistakes in the future. I have been sick for 3 days so no gardening to speak of. I have picked up the occasional leaf, pulled off a couple of dead leaves on the eggplant, cut out a few dead tomato vines, but not much. Now that I am feeling better, I can get back to work. 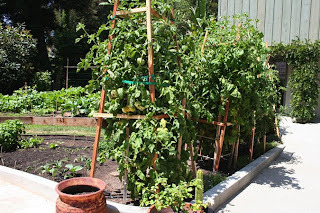 I only have two tomato plants (from the original six) in Garden #1. There is nothing to save. I am pulling them out today or tomorrow. Then I will put the supports in the gardening garage, so the wooden stakes don't begin to rot in the wet soil. I am going to let the ground go fallow for 1 month, before I start planting new crops. News Flash! Don't feed sick plants. I just learned that I should not have given fish emulsion to the Meyer Lemon tree since it has scale. Just cut back the scale and try spraying with a chelate iron/zinc amendment to get rid of the scale. Will do! Both the Meyer Lemon tree in the back and the "regular" lemon tree in the front have some yellow leaves, soooo, I gave them a good dose of fish emulsion mixed with water. I have noticed that some of the other plants and flowers have some yellow leaves. Time to fortify with compost and fish emulsion. Yes!!! Oh well, I guess it's the holiday season and everyone is busy. Raksha would have come to work in the garden, but when she called this morning, I told her I didn't think anyone else was coming. And frankly, there is not that much to do. I took apart one of the tomato supports and put it back in the garage. Did some weeding. Put newspaper in the compost bin and turned it a few times. Tonight, I sprayed my poor Meyer Lemon tree again for scale. The leaves are still pretty yellow. I better feed it tomorrow. Ate a tomato from the garden tonight. It was just okay. I guess it's getting pretty late in the season, plus the cold weather from last week. The skin on the tomato was leathery. However, the broccoli I cut and prepared tonight was delicious. No need to water anything. The soil is still wet from last week's rain. I didn't work in the garden today. Have to get ready for Christmas! My daughters are coming. I am so excited. Hopefully tomorrow I will have gardeners working in the gardens. I want to plant more winter squash, arugula and basil. What to do about the scale on the lemon tree? I am going to do some reading tonight to see what else can be done. I didn't work in the garden today. The earth is soaked through and through. You can't step on the soil without hearing it squish. The newly planted spinach seedlings are looking happy. No sign from the newly seeded arugula or winter squash. Perhaps later next week. Now that the rain is over, I really have to attend to my Meyer Lemon tree. I fed it, I sprayed it for scale and aphids, but it is still looking really sad. I will have to see what else I can do for scale. If you're wondering, scale looks like a shiny overlay on the wrinkled up, curled up leaf. Not good. See, I told you it was raining hard! Whew! It is really raining today. Great for the established plants. I just hope the seeds I planted last week don't wash away. My two 50 gallon rain barrels are full. I should have bought two more. Maybe that's what I'll do this afternoon. 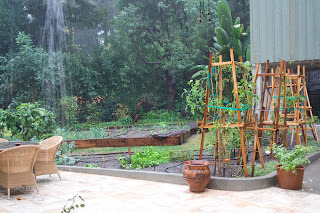 Rainwater is the best for the plants--no chlorine and lots of nutrients. No work in the garden today! It's wet and cold. I have two new gardeners for Saturday. Yeah! Welcome Penny and Debra! I think I will have one more the following week. Things are picking up. Looks like I'll be busier gardening this winter than I thought. Just looking at some old photos. This one of the pepper in the rain is great! I must remember to take some photos tomorrow during the rain. Beautiful day to work in the garden. Two artists came to work today. I think the possibility of rain kept a few people away. Meanwhile, it turned out to be a beautiful day--cool, but sunny. I cut down and pulled out another tomato plant. Now there are only two in Garden # 1 and three on the hillside. Ginger picked up a huge bagful of brown leaves for later use in the compost bin. Juna trimmed and pruned the eggplant and cleaned up dead leaves and debris in both Garden #1 and the Raised Bed. 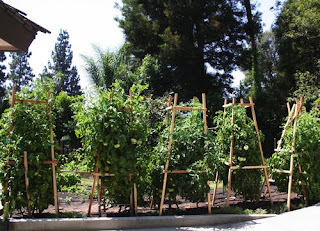 Ginger also weeded the hillside and cut off dead branches on the hillside tomatoes. I didn't plant anything today because it's been so cold at night. Next Wednesday it's supposed to be in the 70s. If it is, I will plant more winter squash and radishes. The green onions are coming up and I think we will have a lot of eggplant in a couple of weeks. Nevertheless, even with the cold rainy weather we still had quite a lot of food to distribute: two heads of arugula, radishes, two small tomatoes, green onions, rosemary and limes from my neighbor's tree. I am still waiting for my avocados to ripen. There are 30 - 40 on the tree. I can't wait! It has been raining all day, so no working in the garden. I am so glad I got all that work done the last few days. All my vegetables are so happy I am sure with this rain. I turned off all my soaker hoses and sprinklers. I also have two 50 gallon barrels catching all this rainwater. I am sure the barrels will be full before the end of the day. They fill up fast. So it's Sunday, but this is Saturday news! No time to blog on Saturday, but it was a great gardening day! Yes, we are now gardening on Saturdays. So many people said they wanted to participate, but Wednesday was a work day and they couldn't make it. So we will try gardening both Wednesdays and Saturdays. A new person came to the garden--Penny. She is a songwriter. I decided we should plant arugula where the tomatoes used to be. I pulled up three of the plants. Penny mixed in the compost and planted the seeds--watering with a mixture of Super Thrive and water. Meanwhile, I picked up more brown leaves for the compost bin and pruned t he other tomato plants on the hill. Then we added compost to the lower hillside garden, in front of the wild strawberries. 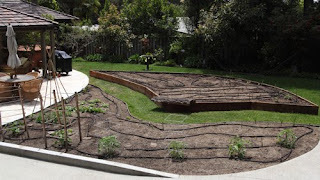 I made two small hills and we planted winter squash-- specifically, Delicata Honey Boat Winter Squash. One of my artist/gardener friends, Ginger, gifted me some seeds, among other things, so I decided to plant them before the rains which are supposed to come Sunday night. I sent Penny home with a head of broccoli, two heads of arugula, radishes, green onions, a small tomato (yes, I still have a few) and some limes from my neighbor's tree. My neighbor, Carolee, has a lime tree in her front yard, and a lemon tree in her back yard and doesn't pick the fruit. I asked her if it was okay for the gardeners to pick the fruit. She said yes. Great! Now we also have some fresh citrus! 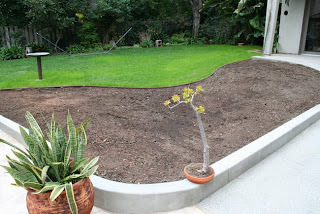 So, I was just thinking about the transformation of my back yard and all that has happened since January, when I started planning this gardening project. It's been wonderful. I have learned so much, made so many good friends, fed so many people. And the people who have worked in the garden not only went home with vegetables, they went home with better friendships and a sense of connection with our earth. Look at the before and after images. I was so tired this morning after carousing until 2 a.m., celebrating my birthday. However, I did do some work in the garden. I sprayed all the eggplant with diatamaceous earth. Hopefully that will keep the aphids and red spider mites in check. Then I sprayed the Meyer lemon tree with Safer's Insecticide (it's organic and not poisonous, you can spray up until the day before harvest). After that I sprayed the oregano and nearby rose bushes for powdery mildew. I may just have to cut out the oregano that is infected. They say it's really hard to get rid of powdery mildew once you have it. The secret is to prevent it from ever appearing. I do not seem to have much luck in that area. So what did I do? I worked in the garden, of course. Turns out there is lots more to do than I realized. A perusal of the garden turned up infestations of bugs. My eggplant have aphids and red spider mite. I washed all the leaves down with water sprayed forcefully from a water wand. Tomorrow I will dust with diatamaceous earth. The Meyer lemon tree in the backyard is also in distress. Aphids, yellow leaves, scale. I fed it Cal/mag liquid and also added some citrus food. Tomorrow I will spray it with Safer's bug spray (it's organic). Two gardeners showed up today: Marissa and Juna. I had them severely cut back the tomato plants, pulling out two of them that had seen their day. They also pulled out some jalapeno and bell pepper plants that weren't producing anymore and were infested with bugs, etc. I cut off dead leaves from the tomato plants on the hill. The spinach is doing well up there.